I expected it, but I still felt kind of awkward when I entered Fábrica Maravillas—the other patrons were also Americans. We are slowly taking over Malasaña, aren’t we? Fábrica Maravillas had been on my “to do” list for quite some time. I had it pinned and everything. Fábrica Maravillas is a craft brew pub which opened in 2012 in Madrid’s Malasaña neighborhood, home to all things modern and hipster. 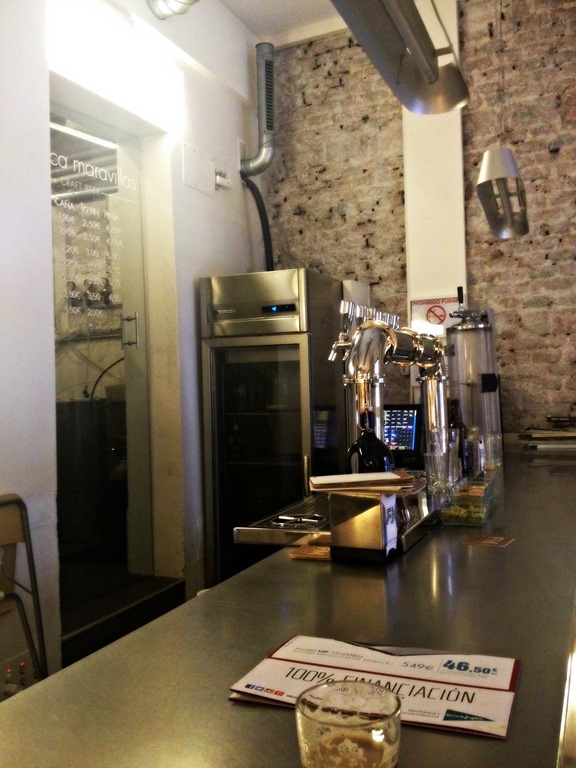 They state their mission as being “the production of high quality, fresh craft beer to satiate the demand of Madrileños” while also educating them about the world of craft beer. Madrid is home to Mahou, founded in 1890, a mass-produced beer found in almost every bar in the form of a caña, a small glass of beer. Served cold, it’s drinkable, if not exactly delicious or high quality. Madrid is a few years behind cities in the U.S. with regards to craft brewing and artisanal beer, but it’s slowly catching up, hipster bar by hipster bar. 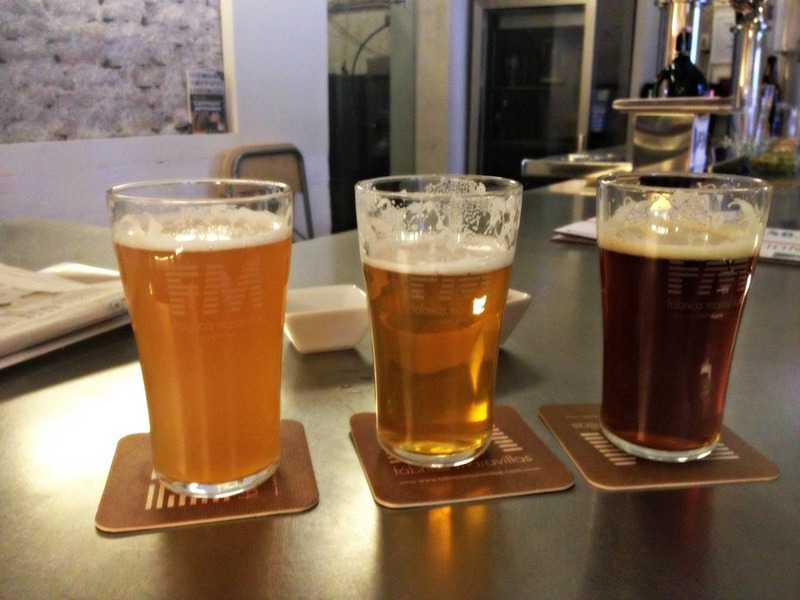 The place is a bit small, but it’s nice and cool—so stop by in the heat of Madrid’s long summer afternoons for one of their delicious beers, served in the form of caña, half pint, or full pint (priced accordingly). This is a blond ale, similar to Germany’s Weißbier. It has an ABV of 5.7% and IBU of 27. I tried this, and I really liked it. Of course, nothing compares to drinking Weißbier in Munich! Mario tried this one and really loved the fruity notes. 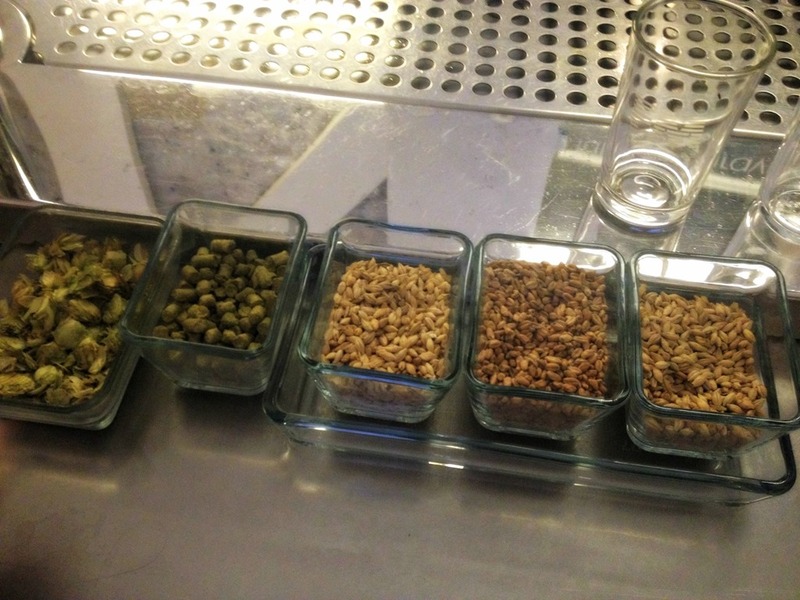 It’s a rye pale pale with an ABV of 5.4% and IBU of 45. The picture above is of this beer, a nicely spicy IPA with notes of malt. It’s a bit stronger, with an ABV of 7.0% and IBU of 74. Perhaps the prettiest color of them all, you can see this beer in the picture below on the right side. This was a refreshing take on the French style, with an ABV of 6% and IBU of 24. The great thing about a craft brewery such as this one is that every so often they’ll come out with a new flavor or experience, so you should stop in frequently to see what’s on tap that day! Near the taps they have some beer-brewing ingredients, including hops, barley, and wheat. 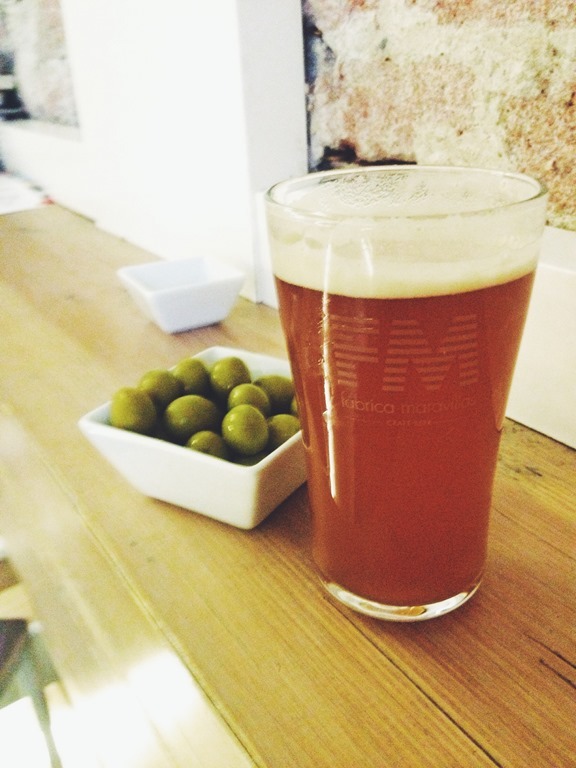 What’s your favorite craft brew in Spain? Related: Check out my post on my favorite craft brew, Domus. Sounds like a great addition to Madrid’s drinking scene! Will have to give it a try. This is a great post Kaley, and craft beer is definitely on the up in Spain. My favourite craft beer is Taifa, from Triana (Seville). It has citrussy notes, making reference to the famous Seville oranges! It is brewed in the nano-brewery in Triana market and can be supped there or in many bars throughout Triana and the city itself. That’s great! I just tried a new Domus beer, called Domus Sevilla, with azahar, so maybe you’ll like that one too! No, no, it’s produced in Toledo; I believe the name was to reflect the style, not the origin. I couldn’t even tell too much difference between it and their regular, so may I just don’t have the “paladar”! I’m not a big beer-drinker but my (American) housemate (in Spain) is a big fan of craft beer so over the past school year I’ve gotten to try something other than the crap corporate beers that you find in every bar across the country. Thanks for the recommendation–I’ll have to go over to Malasaña for a visit next week! Estrella Galicia is pretty decent, though, right? I like it much more than Mahou/Cruzcampo. I realize now that I forgot to even write the address on this post. Blogger fail. Well, the basic stuff they always have on tap in all the bars in Galicia isn’t my thing, but I do like a nice bottle of the fine Red Vintage stuff every now and then. it did fail of course…perhaps in big cities it may go well, but in a deep-rooted normal town the people are used to drink their Mahou, Estrella, Cruzcampo, etc which are the world’s best beers by the way under my opinion. You know Judas is actually a quite popular beer here, right? And of course you’re entitled to your opinion, but I see a huge difference between Estrella Galicia and Mahou. I prefer Estrella Galicia; it doesn’t have the bitterness I find in Mahou. Mario’s cousins prefer Mahou to many beers I find way superior, and I respect their opinions. when i mention Estrella i mean Estrella Levante, one of the best beers that humans can drink. love cerveza. I haven’t tasted spanish beer but here in Manila we have San Miguel beer which I believe is also available in Spain. I was in Rio de Janeiro last year and my favorite beer is their “choppe” — a foamy draught beer. I’m learning spanish again at Instituto Cervantes de Manila. I would love to go back to spain and live there. Yes, San Miguel is Spanish! They are the parent company of Mahou, which you see more often in bars, but you also San Miguel too. That’s great that you’re learning Spanish! How long have you been studying it? Hi Kaley, I’m on Level 1 (Nivel Uno? Is that correct?) My teacher is from Canary Island and I don’t know if I’m learning the right accent. But she sounds good. you are not learning the right accent if you desire to speak brilliant, clear and pure Castilian. Canary accent is similar to Cuban so they use “ustedes” and not “vosotros” as informal second person plural just like some western Andaluces…whereas in the rest of Spain is considered formal and polite only used to address doctors, policemen, the military, the elderly or someone you don’t know who looks older than you….even i have heard people use it to address their own old mother and grandmother, but such a thing is dying out…..also a lot of kids or teenagers have no respect when they talk to a policeman and use “tu”, which is rude and a total lack of respect, in such a case you must show respect and use “usted”. Canary accents are not better or worse, they are just quite different, although you will never sound like people from Salamanca or La Rioja, people who’re a pleasure to listen. some years ago when working on the fields i had a co-worker from Salamanca, and it was a total delight to listen to her ‘cos us Murcians and others Andaluces looked idiot (or i felt like an idiot) due to our accents. I learned Mexican Spanish and came to Spain (Salamanca) and did just fine. Sure, you may have to adjust a bit, but I found learning Mexican Spanish made listening to Castilian Spanish easier actually, because they pronounce more of the word. It’s harder when you learn Castilian and then try to listen to, say, people from Granada or Cadiz. i think that the accent of some Castilians are the most correct ‘cos they sound broad, clear, brilliant and beautiful…at least us tend to consider them to speak the best, whereas the rest of Spain drop whole syllables, don’t pronounce the S in the middle of words and at the end, which is really ugly to the ear, and it becomes even worse when us put words together as in “pa’lante” (hacia adelante), or “voy anca la’buela” (voy a la casa de la abuela)….the last one is very common in Murcia and sounds terrible and illiterate. if you learnt Mexican Spanish, then it is clear that you found Castilian easy, but i am not sure that it makes you understand Gaditano easier….Gaditano may be really hard to understand if they are singing or speaking one another and you try to get it…..so i think that learning Mexican firstly makes Gaditano even more difficult, so i disagree with you on that….please do not get upset. by the way, Granada accents are the easiest of Andalucia, it is soft and warm, totally different to Gaditano or Sevillano.